DirecPay is trying to reestablish itself and loosened its rules as it is welcoming one and all to its folds to capture the market. Till recently it was not accepting stock tips providers but is now welcoming them with open arms. 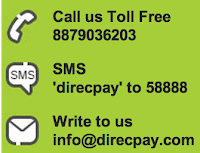 No doubt Direcpay is one of the largest payment gateway solutions service providers in India as it is even helping Google Adwords to undertake payment collection in India. It is a one stop solution for merchants who conduct online transactions or e-commerce. Merchants can accept online payments through various pay modes including Credit Card, Debit Card, Internet Banking and Mobile Payments. In order to capture clients they are running attractive discounts this month for all new merchants.